The weather is getting colder and some of you have already seen the snow. 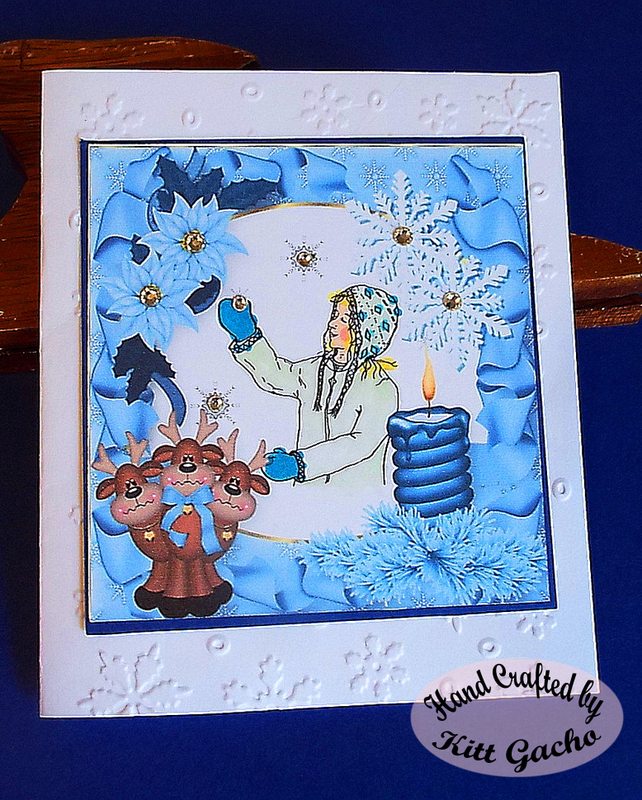 The image of the girl catching the snowflake is from A Creative Need. I'm excited to be part of this talented DT. Be sure to stop by and see the wonderful images available and inspirational projects from the DT. I used Spectrum Noir markers to color the image. For bling I used StampinUp crystals on the flowers and snowflakes. On the base of the card I used Cuttlebug Snowflake embossing folder. I used the Silhouette Cameo to print and cut the image and digital background. The digital background was created in the Scrapbook Max program. Follow me as I share what I learn on this creative journey. Thanks for stopping by today and leaving your comments. I love hearing from you. Have a happy crafty day. Lovely shade of blue and the poinsettias are beautiful. Thanks for sharing on the Delightful Challenge of Twinkle, Twinkle. Beautiful card and the embossed background is just perfect. Thanks so much for joining us at the Hambo Hoedown. Great card - love all the elements!Thanks for joining the Hoedown this month! A lovely Christmas card! Thank you for joining our challenge at 7KCF.